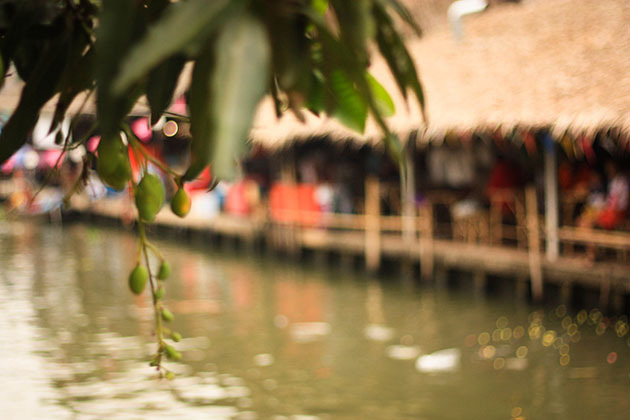 A look into one of the serene floating markets in Bangkok, Khlong Lat Mayom. 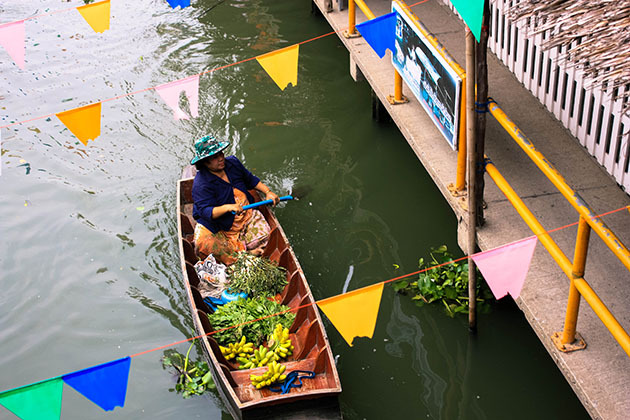 I’m not sure what springs to mind when you think “Bangkok”, but floating markets are definitely one of those iconic photos when it comes to Thailand, especially Bangkok. You know, the woman in the hat sitting in a wooden longboat, pots and pans overflowing with local delicacies strewn around her. Well, we wanted to see what all the fuss was about. 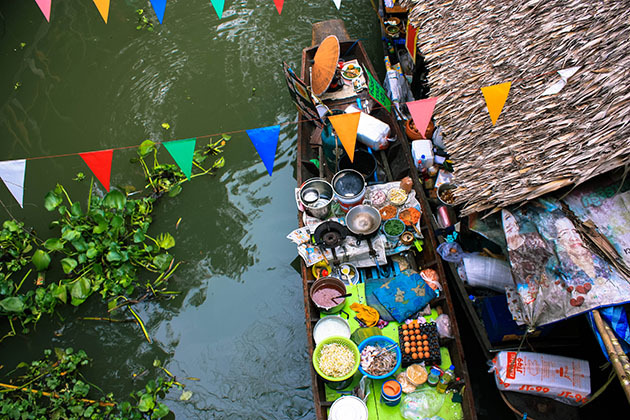 However we read that some of the “main” floating markets, Damnoen Saduak and Amphawa are a bit too touristy for their own good (but who knows, they could be amazing). At any rate, we heard about a smaller market that was apparently more for the locals. 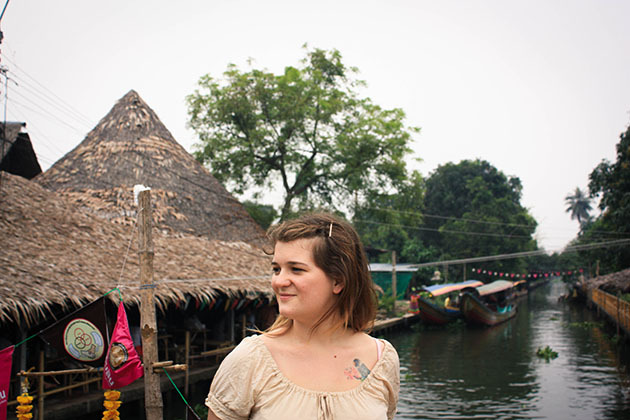 We hopped in a taxi, and it was off to the Khlong Lat Mayom floating market. If you’re planning on going yourself, a taxi from near Khao San road costs about 120 baht (with the meter ON, yo! Don’t get suckered into agreeing on a price without using the fair meter). We arrived at about 10AM, which I think was a perfect time. The market was mostly setup but it was still quiet. I couldn’t see any other tourists in sight, so it was a good start in that regard. 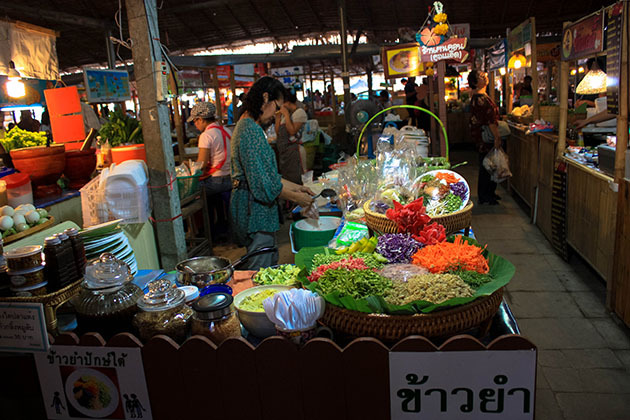 The food stalls were in full swing, and the Thais manning the stalls were all smiles for us Farang. I couldn’t resist grabbing a delicious noodle combination with a shrimp on top. The market was situated with a canal running through it (hence the term floating), most of the stalls were on the land BUT on the flip-side, this was really a market frequented by the locals – and there was more than enough boats and colour for it to live up to the floating market reputation. 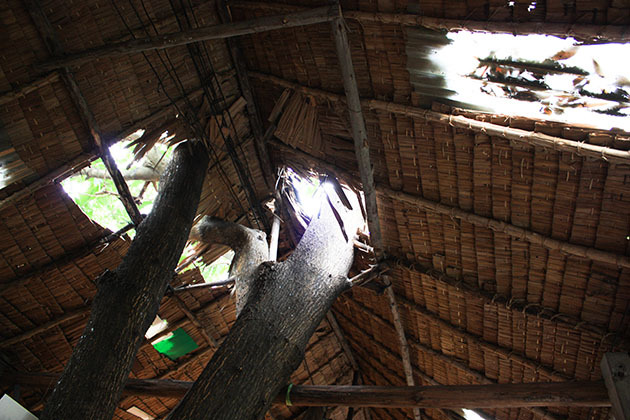 The roof was constructed from woven bamboo, and trees were certainly not hurt in the process. 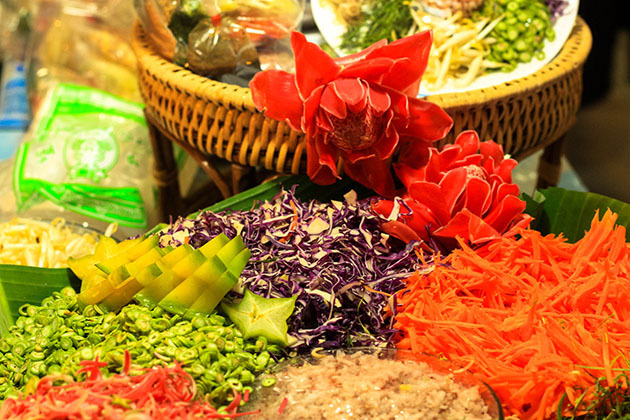 We began to explore the market, and delicacies certainly abound. 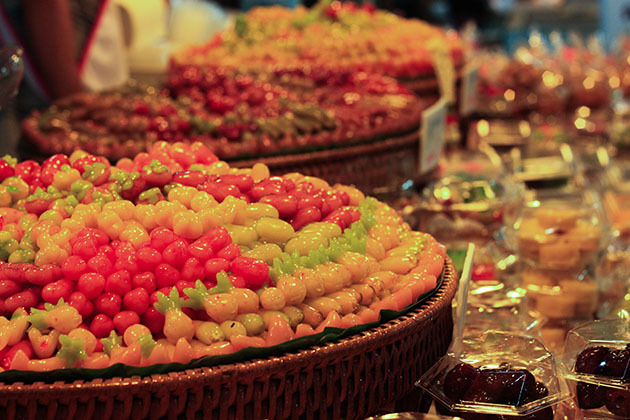 Colourful foods overflowed on carefully set baskets. 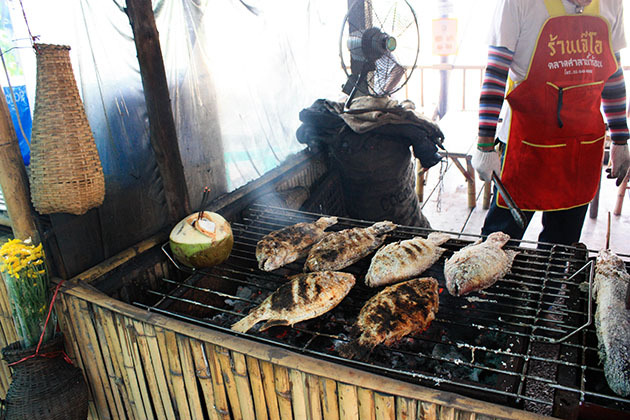 Thai families feasted on huge herb stuffed fish that had been roasted over hot coals. 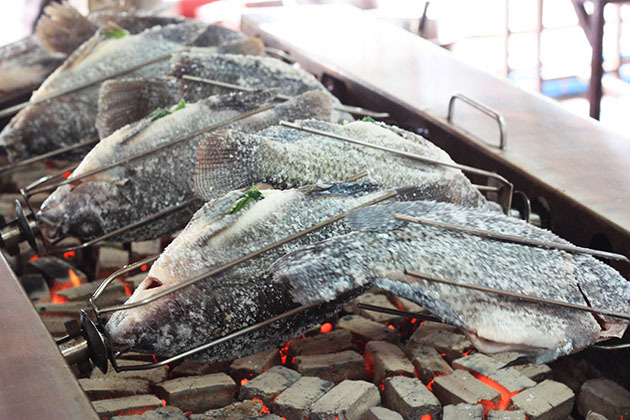 I really wanted to get one, but there was no way I was going to polish off an entire fish so I restrained. They were only 200 baht though ($6.50). After our tour of the market grounds was complete, we crossed a bamboo bridge and went for a walk down the river. This gave us a beautiful view of the markets from afar and Trudy, as always, snapped some gorgeous shots. Wooden longboats loaded with food as we crossed the bridge. This little fella lived in one of the houses perched alongside the river near the markets. A young Thai man gave us a smile as he passed with a relaxed paddle. The Thais are exceptionally fond of their beloved king, and his image can be found almost everywhere. Then it was back to the market for another look and of course, more snacking. 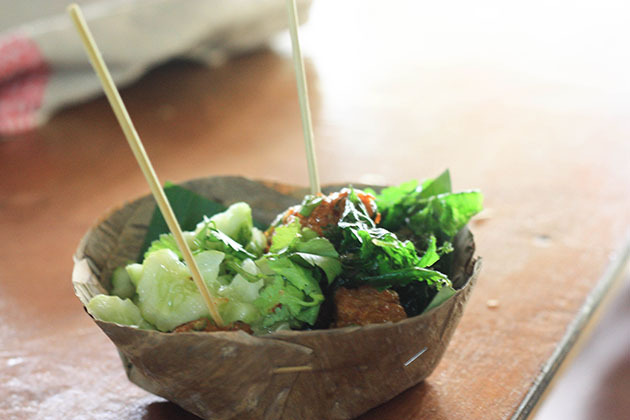 These delectable crispy fish cakes with a kick of chilli will only cost you 30 Baht (under $1 AUD). 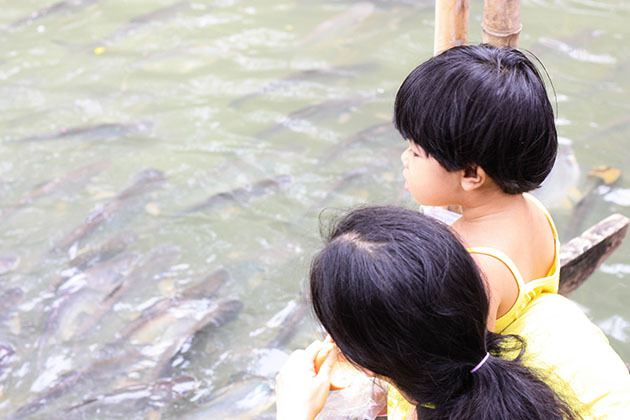 We finished our time at the market watching this family feed bread to the gulping fish. Want to go to Khlong Lat Mayom? The best way to get there is via taxi. In total, INCLUDING the taxi there and back AND all the food and drinks AND a brand new pair of denim shorts for Trudy, we only spent $15. 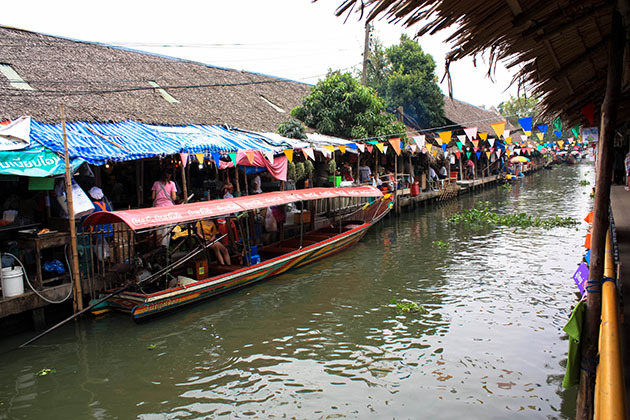 Khlong Lat Mayom is without a doubt worth a visit if you’re in Bangkok. 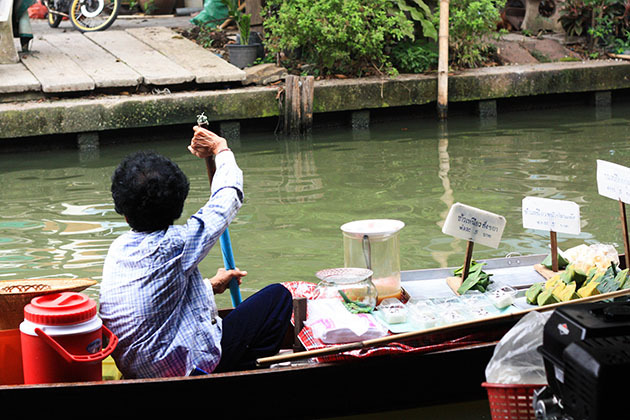 If you’re after a slightly quieter floating market that the locals enjoy, we highly recommend it. Definitely a great experience, The food looks great as well and cheap.. 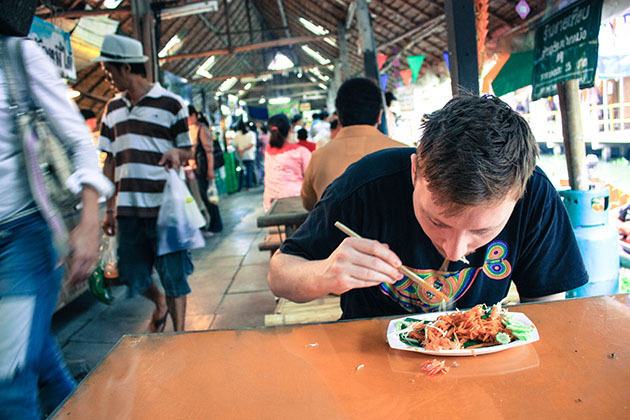 Your article makes me miss Thailand… more like this please! Great post and awesome pics Tom! 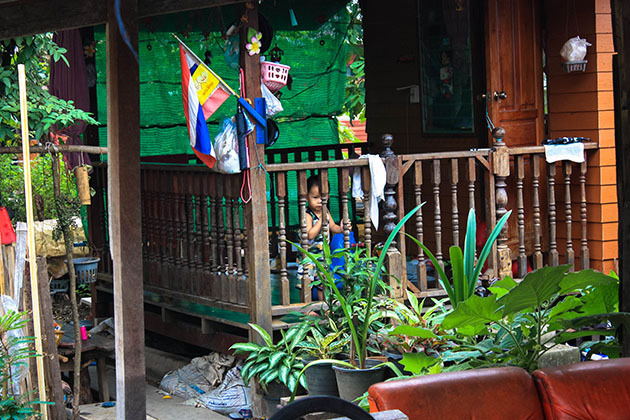 I spent a fair bit of time in Bangkok last year and ended up not visiting the floating markets because of the overwhelming advice that it was an un eventful tourist trap. This smaller one seems more legit, Im in Bangkok for a few days next week so might go and have a look myself! Sorry for the late reply, did you get to the markets? We heard that the larger ones were super touristy so we ventured out to this one, it was small but definitely worth it. 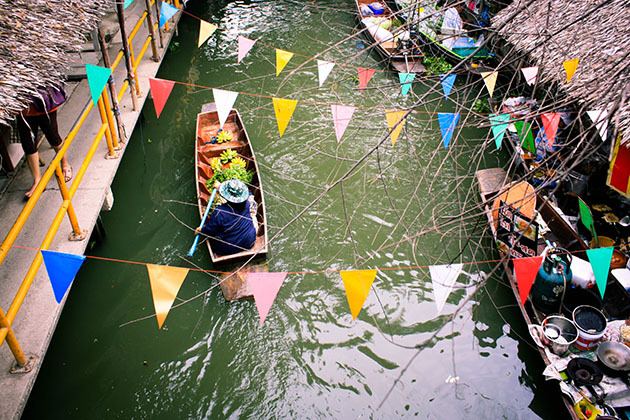 Hi Trudy, we will be visiting Bangkok during the week of 20-25th May and would so love to experience the floating markets. 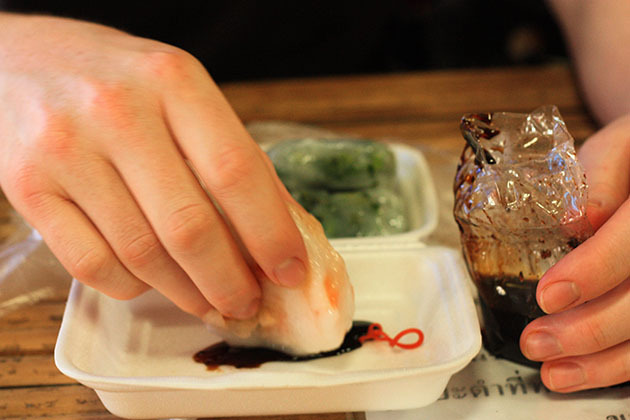 We unfortunately fly home on the Saturday so wanted to know if one can also visit the markets Monday to Friday? 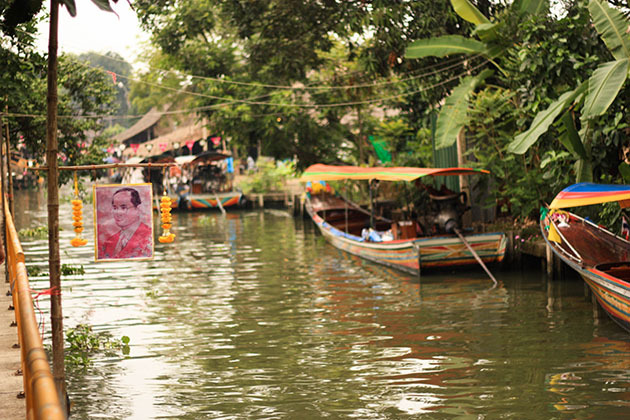 Hiya Denise, unfortunately the Khlong Lat Mayom floating market is only open on the weekends. Here are the opening times: Saturdays, Sundays and public holidays from 9:30 am to 4:30 pm.